I made a really great pie crust the other day for a chicken pot pie. It was light and flaky and probably the best one I have ever made! I always look forward to the pie crust trimmings because there is a potential experiment waiting for me! Typically I make the usual cinnamon/sugar roll cookies with my pie crust leftovers but sometimes that’s too boring. Last time I made cute little muffin size quiches that I thought were really good… However my houseful of men were not all that impressed with them. This time I thought I’d make ‘cracker’ type snacks! So I carefully rolled out the dough and used my heart cookie cutter to make cracker shapes (no, I’ve never seen heart shaped crackers either – but I didn’t have a square cookie cutter and it was either a heart or Christmas shapes and I don’t know about you, but I’m not ready for Christmas YET!). I tried to get as many as I could out of the first rolling of the dough so I wouldn’t have to roll it out too many times and ruin the butter chunks! I did have to roll it out a second time but that was OK (to me anyway!). I melted a little butter and brushed the hearts. Then I sprinkled each one with toasted sesame seeds and Kosher salt. I baked them in a preheated (425°) oven and, thinking they wouldn’t take long, I set the timer for 5 minutes. And then another 5. And another 5. I think they ultimately took about 20 minutes! They didn’t brown much on top but the bottoms were a nice golden brown. So… I tasted them… And the results are……. Light, flaky, buttery, and BLAND. 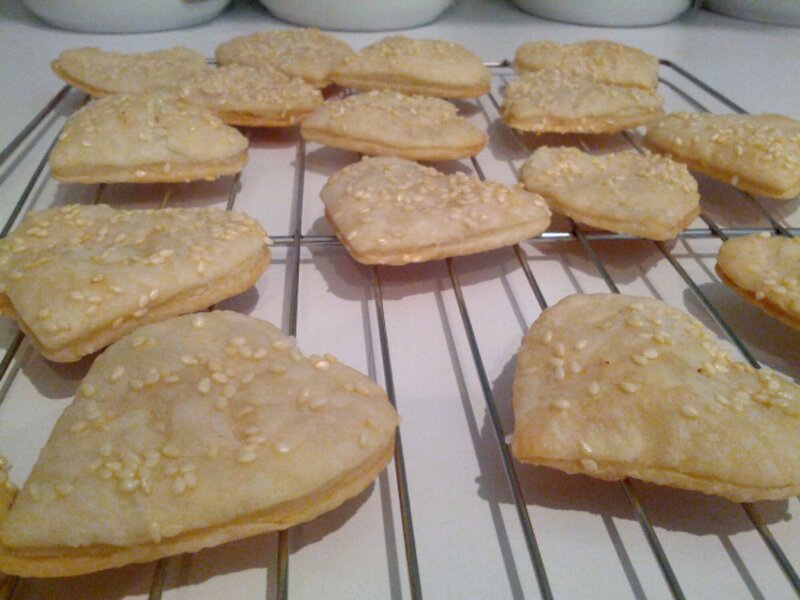 Next time I think I will turn them into ‘pocket crackers’ and add a filling between two hearts & crimp them together. Maybe cheese. Yum. What a great idea! It seems like a waste to throw away leftover pie crust, that’s for sure! Thanks! I appreciate you commenting! !